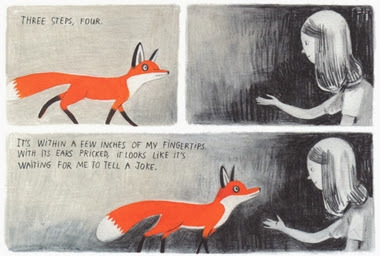 Jane, The Fox & Me by Fanny Britt and Isabelle Arsenault: This is a gentle, subtle graphic novel about growing up as a girl in a world full of conflicting pressures, about loneliness, and about finding refuge in Jane Eyre. It’s also one of the most visually stunning comics I’ve read in a long time. The protagonist, Hélène, is taunted by her classmates and former friends because she allegedly “weighs 216 and smells like BO”. She reads Jane Eyre on the school bus every day, and manages, for a little while, to shut out the world. 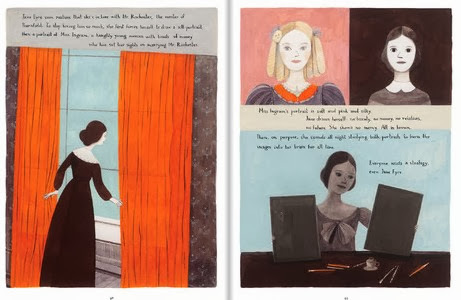 Hélène’s connections with Charlotte Brontë’s heroine, with the fox she spots outside her tent during a class trip one night, and with her new classmate Géraldine eventually allow her to begin to believe that, no matter what her tormenters say, she is worthy of love. That probably sounded a little too After School Special in my clumsy rewording, but trust me when I say that this is a book that handles its subject matter with remarkable grace. 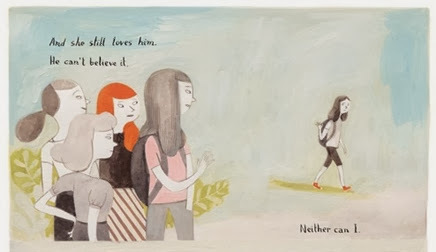 Jane, The Fox & Me was almost too vivid a reminder of what a hell middle school can be. It was, however, also a reminder that sometimes the little things can save you; that books can be a refuge; that having just one person by your side can make the prospect of taking on the world seem, if not pleasant, at least survivable. Towards the end of the story, Hélène (who is always portrayed as thin in Arsenault’s illustrations) visits the doctor and is told that her weight is in reality 88lbs. Her perception of herself, like that of many girls who suffer from eating disorders, has been severely distorted by a world that holds extreme thinness as an ideal every girl and woman must aspire to. This brings me to the last point I want to make: sometimes, when you read a story, you start thinking about how inside it lurk the ghosts of all the other stories that also need telling. For example, stories where bisexual women’s relationships are not portrayed as transitory or unimportant even if they end up in long-term relationships with men are important, but so are stories where women get to end up together. I love many stories that show us how individual women fall victims to unjust social systems that leave them with no options, but I also want to read stories where women succeed against the odds. The more I think about this, the more I want to ask for more without asking for less. I want to critique the cultural biases that lead us to privilege certain narratives without sounding dismissive of the stories we’re already getting — we do, after all, need all of them (obviously my argument doesn’t apply to damaging and dehumanising narrative tropes, which as we know are sadly abundant). I really enjoyed Jane, The Fox & Me, and I think that in a world where eating disorders are a thing we need stories about girls struggling with body image. I just hope that one day they get to happily coexist with stories about girls who do weigh 216lbs and love Jane Eyre and approach foxes in the dark and get to make new friends. How to be a Heroine by Samantha Ellis: Confession: I brought this book home from the library because I got it mixed up with The Heroine’s Bookshelf by Erin Blakemore. No matter; the premise of the two books is similar, and I’m always up for a good book about books — especially if it emphasises works by and about women. How to be a Heroine is a reading memoir by playwright Samantha Ellis, and it begins with her having a discussion with her best friend where they compare Jane Eyre and Wuthering Heights. Ellis, who had always been Team Cathy, begins to reassess her opinion of Jane. Using this as a point of departure, she decides to get reacquainted with all her heroines: Anne of Green Gables, Emily of New Moon, Jo March, Sarah Crewe, Scarlet O’Hara, Lucy Honeychurch, Emma Woodhouse, Lizzy Bennet, Scheherazade, and many more. Ellis revisits many of the books she first read in her formative years, compares her original readings of these texts with her current ones, and realises that divergent and even contradictory readings can be equally valuable to her at different times of her life. The result is a love letter to the books that form us and the ways in which they change along with us. I think I actually liked the personal bits of How to Be a Heroine better than the reading ones. All the details Ellis includes about growing up as a woman of Iraqi-Jewish descent in Britain, about writing, about navigating social expectations, about coping with chronic illness, and about dealing with the pressures placed on single women were fascinating to read. This isn’t to say, however, that there aren’t also some excellent passages about reading: the chapter about Franny Glass from Fanny and Zooey made me tear up because it did such a good job reminding me of why that book was important to me; and I laughed out loud when reading Ellis’ affectionate evocation of problem-solving Flora Poste from Cold Comfort Farm. There was one thing that prevented me from truly connecting with this book, though — the fact that Ellis’ readings were sometimes too focused on the dutiful wearer rather than the corset. I could write a whole other post about the concept of a “doormat” and the way it’s used in criticism, and I’ll try my best not to shove all my unspent frustration into the rest of this paragraph, but: even when you have perfectly legitimate issues with how a female character is written or treated by the narrative, dismissing her as weak and spineless kind of implies that when bad things happen to women, they bring them upon themselves by failing to be more assertive. If a fictional woman is written in such a way that she fails to act when it would have been possible for her to act, then the author is at fault, and this can and should be addressed in ways that don’t adopt the rhetoric of victim-blaming. For example, there’s plenty to say about the ideal of sacrificial Victorian womanhood embodied by Beth in Little Women, but this can be done without calling her a “wet blanket” as Ellis does. Doing so draws attention away from wider cultural trends and makes her death about her own personal failings, and I think we can all agree that this is ridiculous. Also, the discussion around the gender dynamics in Gone With the Wind made me uncomfortable at times — I would expand on this, but I haven’t read the book and I would love to hear the thoughts of more people who have. 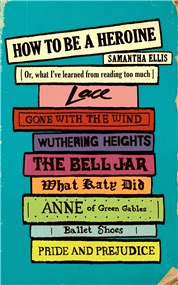 I hope I’ve made it clear, though, that I found How to be a Heroine worth reading even if Ellis lost me at times. I must find the Erin Blakemore and see how the two compare. 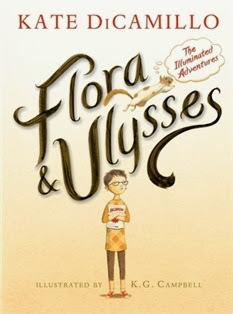 Flora & Ulysses: The Illuminated Adventures by Kate DeCamillo and illustrated by K.G. Campbell: The winner of 2014 Newbery Medal begins when Flora Belle Buckham, a ten-year-old comic book loving self-proclaimed cynic, witnesses an innocent squirrel being sucked into a Ulysses Super-Suction Multi-Terrain 2000X vacuum cleaner in her neighbour’s back yard. Flora’s scream comes too late to stop the tragedy, but when she rushes to join Mrs Tickham, the two discover that the squirrel in question has not only survived the ordeal, but seems to have acquired super powers. 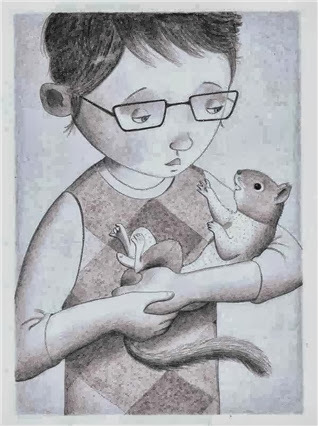 Flora is immediately reminded of the origin story of her favourite superhero, the Amazing Incandesto, and decides to name the squirrel Ulysses after the weapon of his near demise. Ulysses can leap across long distances, fly, lift the vacuum cleaner above his head, understand human speech, and — most remarkable of all — write poetry using Flora’s mother’s typewriter. The only explanation, Flora decides, is that he must be a superhero. But reading stories has taught her a thing or two, and Flora knows that if there’s now a superhero in her life, then his super-nemesis must not be far behind. Guys, I want a poetry-writing squirrel of my very own. It’s very hard to read this book without ending up convinced that your life is incomplete without one. Ulysses is my ideal antrophomorphised animal: he shares interests with his fellow humans, but he managed to remain delightfully squirrel-y all the way through the story. Half the charm of Flora & Ulysses is in K.G. Campbell’s illustrations, particularly in how they bring Ulysses to life by giving him a remarkably expressive face. I just wanted to hug him all the time. Flora & Ulysses combines traditional chapters, full-page illustrations, and comic book segments in a seamless way: the art adds so much to the story. 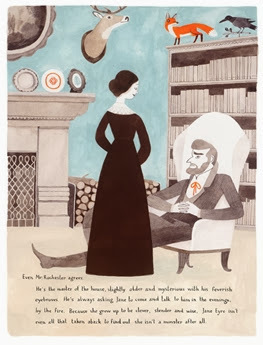 The effect is not unlike that of Brian Selznick’s books, though Flora & Ulysses is more text-based, and what Campbell and DeCamillo do is a little different. It’s also a little like a young Kavalier & Clay: a warm, smart and loving tribute to superhero comics and the people who love them. Flora goes around shouting “Holy bagumba!” and “Malfeasance!”, remembering that “Terrible Things Can Happen To You!”, and trying to make sense of life using the stories she loves as a blueprint. The narrative both supports and gently challenges her efforts: Flora is right about superheroes, but real life super-nemeses turn out to be a little more complicated than she initially gives them credit for. Next up: Emily of New Moon! 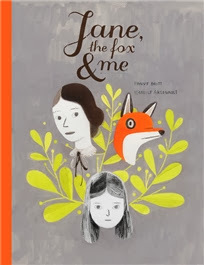 Jane, The Fox & Me sounds just wonderful! I need to get my hands on a copy. 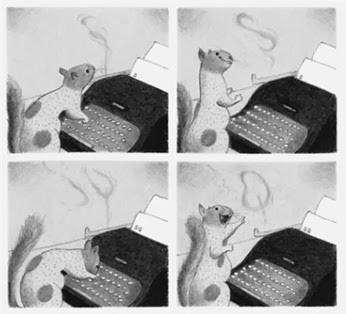 Who doesn't want a poetry-writing squirrel?! Those illustrations are too cute. Arsenault's art is so beautiful! You keep highlighting books with such lovely art that I want to buy the books, slice out the pages, and use them to decorate my walls. 'Flora & Ulysses' - what can I say? I am totally charmed by your description of the book. I want to read it now! A squirrel which quotes Rainer Maria Rilke - how can one resist that :) Thanks for introducing this charming book to us. Jenny: Hahaha, I know what you mean. I keep wanting to bring picture books we're going to discard home from the library to do just that. Vishy: I think it's possible (which isn't to say I always manage to do it successfully) to critique forms of sexism that are closely tied to a work's historical context in a way that takes the limitations of said context into account. 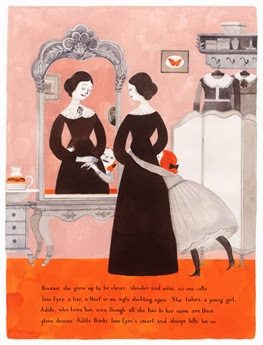 One of the things I enjoyed the most about Little Women was that you could clearly see Louisa May Alcott's proto-feminism at work, even if in the end the rebellious nature she gave a character like Jo was crushed. I think sometimes nineteenth-century authors gave their characters disappointing endings almost as a form of sleight of hand - they could point to them to quiet down the outrage, but the possibilities their characters raised BEFORE the endings were still really exciting and deeply subversive (you see that a lot in Mary Elizabeth Braddon, and it's one of the reasons why I'm so interested in her work). As a 21st century reader, I find that both frustrating and fascinating. Anyway, the point I wanted to make here wasn't restricted to 19th century works. Just, it really frustrates me to see people go "I hated that book's protagonist, she was so weak and passive!" when they really mean to say "this character was written without agency, and I wonder if it's because the author has a hard time imagining women being the subjects of their own lives". I can understand the latter perfectly well, but the former is a little too close to the kind of "Well, why didn't you stand up for yourself?" discourse people use towards victims of real life violence and abuse for my comfort. Does that make sense? Marisa: Aw, thank you :D I hope you enjoy it! It's a very quick read, but so beautiful. 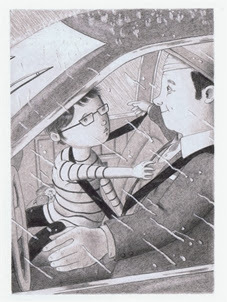 The Jane, The Fox & Me illustrations are indeed stunning! I'd love to own a copy of that even just for the art. But you did convince me that the story itself is worth reading. And I'm now so excited about Flora & Ulysses, thanks to you! You know, she is worthy of love is actually a really valid theme for a story imo! I think positive edifying ideas can be hard to pull off, but we need them and that's why even "after school special" esque stuff gets a pass from me for having good intentions. 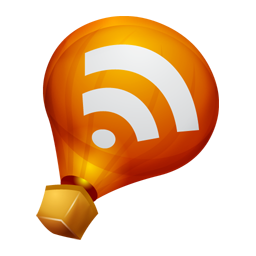 Sorry, lol, something about you saying that sparked something in me! I guess I sometimes get tired of the detached cynicism that is somehow more acceptable., ugh on the other hand I do understand why people feel frustrated with stuff they deem overly sentimental or a waste of perfectly good emotion. Anyway, these books all sound good! Kelly: I hope you enjoy them! Claire: It is, but like you I'd just love some prints of the art. So gorgeous. Susan: I look forward to hearing what you think! Flora & Ulysses reminded me of how much I adore Kate DiCamillo. I'd missed her last few books, so now I'm dying to catch up. Amy: You're right, of course. I love stories like that, yet I kind of start pre-emptively defending them in my head because I know there are some topics that are very easily dismissed. It probably just goes to show how pervasive that is. Wow, that first one looks and sounds amazing. Definitely will be looking that up! I'm really excited for Flora & Ulysses! I haven't bought it yet, because I've spent too much money on books recently...but soon, it shall be mine. I'm glad you enjoyed it, and the art looks wonderful!